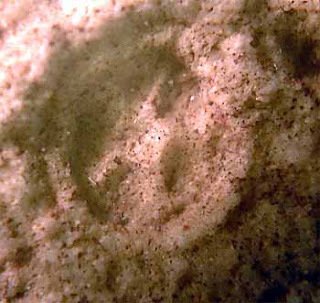 The Echinoblog: Raiders of the Lost "Ark"arua? The oldest Echinoderm?? If its 5-part symmetry makes it an echinoderm, then wouldn't it be up there where that synapomorphy evolved? If so, then stereom should have evolved prior to Arkarua. But, there is no stereom anywhere (so far found) in Precambrian rocks. I would conclude that Arkarua cannot readily be interpreted as an echinoderm. 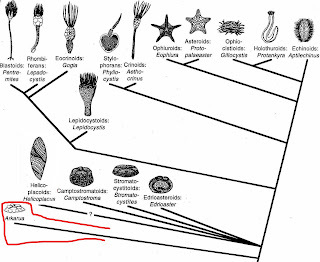 Second line of evidence: If Arkarua is an echinoderm, then Bilateria is older than Ediacaran. Early bilaterians were worms. Worms make tracks. No tracks or trails prior to the Ediacaran. Thus, Arkarua probably isn't an echinoderm. For what they are worth, my 2 cents. I think that the problem with these very old fossils IS the interpretations of the fossils. Some might argue that the marginal rim IS stereom or stereom-like. I believe Gehling interpreted several of the features as consistent with echinoderm characteristics. The difficulty of your position is the argument of non-presence. The absence of presence is not presence of absence. No worm tracks? Not evidence that they weren't there-only that you don't see them in the fossil record. In my professional opinion, it looks like a smiley face, therefore bi-symmetrical.